With a name like Techno Trancer, I was expecting a lot more “untz untz” and less “OMG SENSORY OVERLOAD!” I would advise anyone with even the remotest possibility of epilepsy or migraines to avoid this one like the plague. I have no history of either, but this game gave me a hell of a headache. A vertical scrolling shooter, Techno Trancer feels a little bit like the unholy spawn of Space Invaders and a Captcha. My eyes never knew where to focus. Unfettered by the technological limitations of their elegantly spare arcade inspirations, Techno Trancer pulls way too many elements in play, resulting in a hot mess. Admittedly, I’m not a huge fan of “bullet hell” type games in general, but Techno Trancer is still exceptionally cluttered for the genre. Before you start, you have a choice of controls: touch, tilt, and something called V. Con, which I never successfully understood. The game comes with very little information or instruction, so you generally have to figure it out as you go. I played mostly in touch for reasons what will become obvious later. Once you start a game, you get a retro-styled ship, three lives, and as much shooting as you can handle. You can move over the whole screen, but the ship is always vertically oriented and firing. There are, naturally, plenty of enemy ships to encounter, which explode in a shower of golden squares if you manage to destroy them. From what I could tell, you get points by collecting the golden pixels. 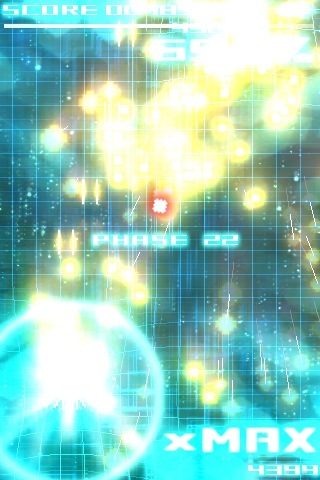 Enemy ships fire red squares, which sort of collect around you, like homing missiles. They get partially held at bay by your bubble-like shield, but if they get through, of course, you explode. There are usually a LOT of red squares on screen, all festering around the edges of your shield and making it exceptionally difficult to navigate. There is also a constantly pulsating background and hyperactive soundtrack to further distract you. And if that isn’t enough, every once in awhile (possibly when you’re doing really well, but I couldn’t quite figure this out), the entire screen will explode in white light, causing you to lose your bearings altogether. Trying to use the touch screen in all this madness was difficult, but trying to use the tilt controls was downright impossible. Sadly, the touch controls aren’t even very good, making the entire experience an exercise in irritation. Bottom line: There are lots of retro-style arcade games out there. Don’t waste your time with this one. AppSafari review of Techno Trancer was written by Tracy Yonemoto on May 21st, 2010 and categorized under Action, App Store, Games. Page viewed 2298 times, 1 so far today. Need help on using these apps? Please read the Help Page.